The Formax 6306 Series Inserters combine user-friendly features with dependability. Five configurations are available to meet the needs of most mailrooms. A high-capacity document feeder for up to 725 sheets, a high-capacity production feeder, standard and special feeders, and short feed trays are a sample of some of the possible configurations. 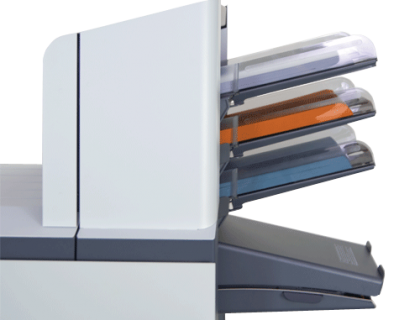 Users can store up to 50 jobs configurations, using the full-color touchscreen for efficient and hassle-free set-up and operation. 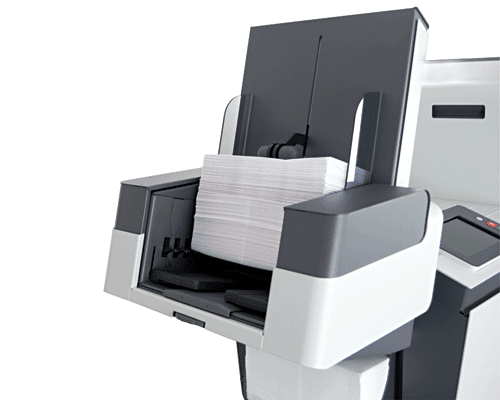 Standard features of the Formax 6306 Inserter includes an eco-friendly sleep mode to save $$ on electricity. 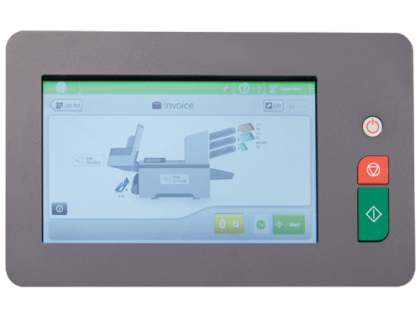 It includes a 7” full-color touchscreen control panel with a simple to use graphical interface, automatic paper and envelope presence sensors with indicators on the control panel, high-capacity vertical stacker which holds up to 500 finished envelopes, and a large top-loading envelope hopper with a capacity of up to 400 envelopes. 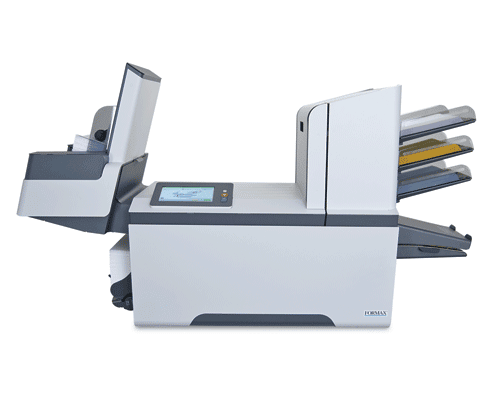 Variable page insertion with CIS scanning technology that covers the full width of the document feeders and accurately reads OMR, 1D and 2D barcodes printed in any location on a document. 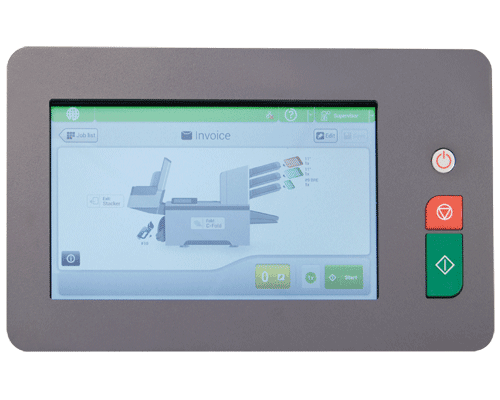 Optical Character Recognition (OCR) is also available, which uses page numbering in 1/1 or N-of-M format to ensure each set is complete before being inserted into an envelope. The folder on the 6306 Series is powerful enough to fold up to 8 pages in tri-fold and up to 10 pages in half-fold modes. 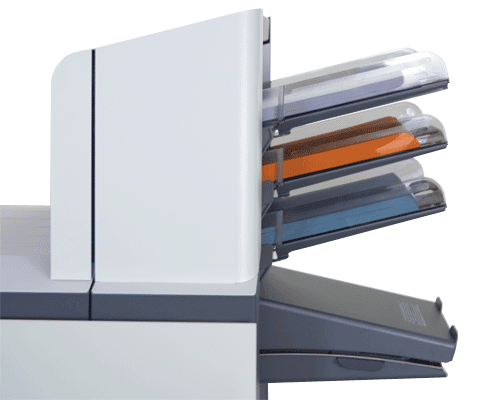 Its versatility allows for processing forms of various lengths and thickness all at the same time, up to 3,800 per hour and up to 40,000 pieces per month. Cascade Mode: Maximizes output by connecting multiple feeders with the same document. When one feeder empties, the next automatically starts feeding, for a total hopper capacity of up to 975 sheets. Problem Envelopes: If you’re suddenly having trouble running a job, take a close look at the envelopes! Odd envelopes with strange deep or odd flaps tend to cause a problem.